Artist's conception of the planned Audacy space-communications network. A new company aims to provide the communications capacity required for the ongoing private spaceflight revolution. 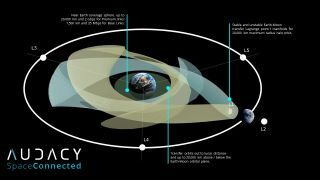 Around Aug. 1, California-based Audacy plans to close a Series A fundraising round of at least $15 million to begin creating three satellites and two Earth stations. The goal is to raise four major rounds of funding, build the ground stations and get the satellites launched by 2019. All told, the plan will cost about $750 million — $250 million in funding and $500 million more in government-backed debt, Audacy representatives said. According to Audacy CEO Ralph Ewig, this capacity will let the company help Earth-observation companies (such as Urthecast or Planet Labs) send back data to customers, help spacecraft-launching firms keep a better eye on their rockets or help internet service providers keep track of large constellations of satellites. "There will be a large number of LEO [low Earth orbit] spacecraft in the next couple of years," Ewig told Space.com, adding that there will be anywhere from 2,000 to 6,000 satellites launching in the near future. Ewig's goal is to provide a network similar to NASA's Tracking and Data Relay Satellite (TDRS) system, which was built for the space shuttle and is now used for the International Space Station (ISS) and for supporting robotic cargo ships, such as SpaceX's Dragon capsule. The first customers should then sign on shortly afterward, Ewig said, provided that customers are assured that the satellites are being built, that there's a rocket to launch them on and that radio regulations are being cleared with the Federal Communications Commission. Audacy plans to build the ground stations in the San Francisco Bay Area and Southeast Asia, which should provide almost constant communications with the planned satellites. Eventually, a third ground station could be built in Europe. Ewig first thought of this idea when he had access to TDRS, as a mission operations engineer for SpaceX's Dragon spacecraft. TDRS doesn't have the capacity to support hundreds of new launch providers, and neither does the existing network of geosynchronous satellites, Ewig said. So he thought about making an alternative. Ewig is considering some ideas for partnerships with the Department of Defense and other agencies. If those partnerships bear fruit, Audacy could connect spacecraft so that a smaller cubesat, for example, could relay news of an interesting event on Earth to a big satellite with better cameras. In addition, the Center for the Advancement of Science in Space (CASIS) — the nonprofit that manages U.S. experiments on the ISS — could use Audacy's data services to increase its capacity to send information to scientists, Ewig said.